What exactly should we make of Real Madrid's preseason form? Admittedly, the signs have been nothing short of worrying and it has little to do with the results. Real Madrid have looked hapless and unimaginative so far in the two games played against Manchester United and Manchester City and frankly, completely toothless in attack and defense without Cristiano Ronaldo, who is still on vacation until the team flies back to Spain and Sergio Ramos, who has already joined the team but wasn't given any playing minutes yet. 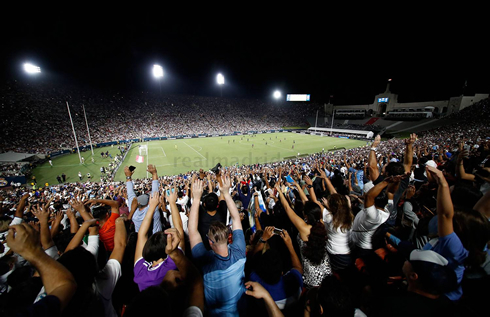 This Saturday, Barcelona awaits the Merengues for the first El Clasico in history to be played in the United States. Against both Manchester teams, Real Madrid struggled to create clear chances and it was even more evident in the second game, as Pep Guardiola's Manchester City retooled side looked like they could have scored 8 on the night if it wasn't for Navas and some misfortune from the Citizens in front of goal. Dani Carvajal has been nothing short of atrocious, which is surprising considering his usual consistency. Up top however, is likely the most concerning part of Real Madrid's preseason. Gareth Bale and Karim Benzema have showed a somewhat alarming lack of chemistry in attacking areas. Individually, both have been timid. Bale seems to be, understandably, concerned about his fitness. Benzema on the other hand, usually stays in this current phase all season long, so he's not too surprising. However, without Alvaro Morata to push him, one wonders if the Frenchman will be able to stay sharp all season long. It's preseason, so it technically doesn't matter. Nevertheless, let's hope for at least a better performance regardless of result this Saturday night against Barça.